85% of all pets have disease in their mouth that can spread and damage other parts of the body. 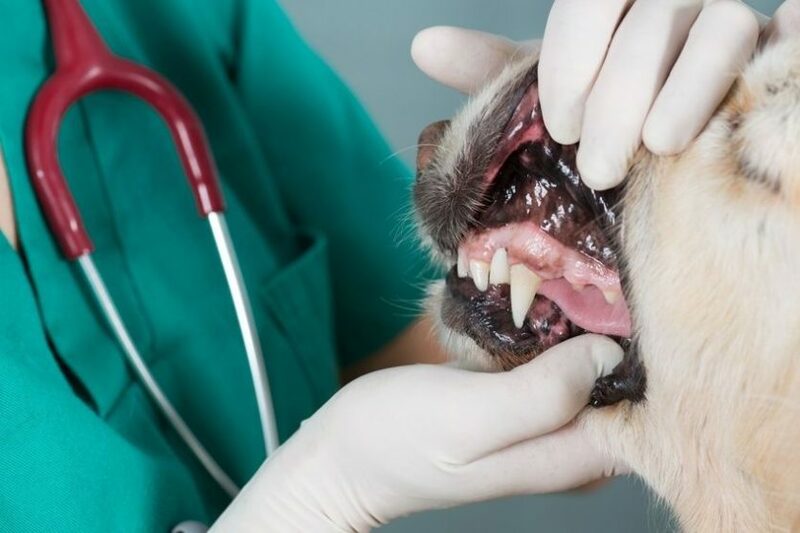 Cavities are rare in pets, but periodontal disease (gum disease) is the most prevalent. Plaque (bacteria) attach to the tooth enamel. This starts as a yellow stain on the tooth. The gums become red and painful and recede, exposing the tooth root. At this time, there is a foul odor in the mouth, and bleeding gums. This process eventually causes the tooth to abscess and fallout, but this is only the start. Infection then enters the bloodstream and travels to the heart, liver, and kidney, causing these organs to fail. Periodontal disease is a silent killer. When the pet stops eating, it is too late to save the tooth, and the infection has already spread throughout the body. Nature tells the pet to suppress pain because if they look painful, they become prey to another animal. This is why pets with severe infection go unnoticed, because they are not acting abnormally. Lift the lip of your pet and check the teeth in its mouth for a yellow stain, red gums, and mouth odor. All of these signs spell periodontal disease. Dogs with hair around their mouths are more prone to periodontal disease. The hair harbors food particles that bathe the teeth in bacteria. Breeds at great risk of periodontal disease are: poodles, yorkshire terriers, schnauzers, and shih tzus. Bigger dogs injure their teeth by chewing on hard objects. Veterinary dental specialists now recommend that you do not give a treat to your pet if you cannot compress it between your fingers. Bones, Nylabones and cow hooves all break the teeth. A healthy mouth promotes a healthy body. Dentistry for pets has progressed from the days of just scraping the surface of the tooth to clean it, and simply pulling infected teeth. This did nothing to improve the life of the pet. Countryside Animal Hospital is dedicated to improving the healthy of every pets mouth and thus, their whole body. A complete oral examination is performed under anesthesia. Only one third of the tooth is visible in the mouth, the root is under the gum in the jaw bone. Complete full mouth x-rays detect the extent of the damage to the root. Procedures such as root canals can be performed to save a tooth. Some teeth cannot be saved. Extraction is often necessary. Complete extraction can only be obtained by removing all roots with oral surgery. Nerve blocks coupled with general anesthesia eliminate pain. The gum is incised and reflected, exposing the jaw bone. Bone burrs are used to remove the bone holding the infected tooth, exposing all roots of the tooth. The tooth is sectioned off and each root is removed separately. The gum is then sutured. X-rays of the mouth will show permanent teeth that have not erupted through the gum or bone cysts. In some cases, a referral to a board certified veterinary dentist will be made. Tooth cleaning is not complete unless special dental x-rays are taken. Two thirds of the tooth is still hidden below the gumline. Home care after the teeth cleaning will prevent further damage due to plaque. The hospital has many approved products to keep the pets mouth clean. Cats can develop periodontal disease as well, but a major problem in cats is root resorption. The cause of resorption is unknown, but the body attacks the tooth, dissolving roots and enamel. The process is very painful and leads to gum disease. In severe conditions, the teeth will need to be extracted. Our hospital has seen this condition in cats as young as 6 months. A complete mouth examination with x-rays will reveal this condition. Keeping the teeth clean will slow this disease process.